The following figure shows the main components of the CUBA application middle tier. Services are container-managed components that form the application boundary and provide the interface to the client tier. Services may contain the business logic themselves or delegate the execution to managed beans. 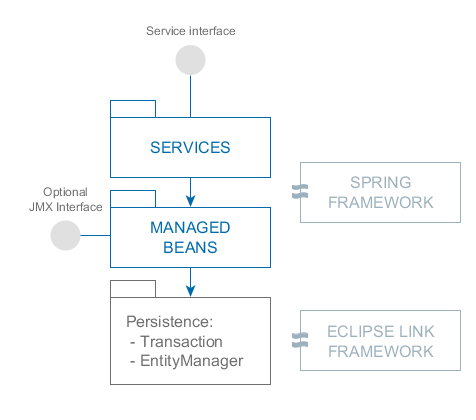 Managed beans are container-managed components that contain the business logic of the application. They are called by services, other beans or via the optional JMX interface. Persistence is the infrastructure interface to access the data storage functionality: ORM and transactions management.